The name of saxophonist Ben Britton's new outfit, Unconventional Riot, might suggest some hard-edged, in-your-face, Mostly Other People Do The Killing type of jazz. The title of the band's debut "mini album," Children At Play, is more indicative of a looser, lighter and less serious approach. The reality is somewhere in the middlea tight, swinging trio of straight-ahead tunes with some subtle musical twists and turns, and a mix of gentleness and wildness that amalgamates and also belies the titles of both band and album. Britton's 2010 debut album with his trumpet playing brother John, as The The Britton Brothers on their self-produced Uncertain Living, was a fine album that established the brothers' musical and compositional chops with an array of tunes whose influences stretched from be-bop through to hip-hop. Children At Play doesn't display quite as wide a range of influences, but there is plenty of variation across its 25 minutes. The title track is the most relaxed of the saxophonist's three tunes. Britton's tenor dominates the performance, but while he's melodically inventive he's also pretty mellow, as is guitarist Matt Davis, who contributes a flowing and lyrical solo of his own. "Partly" moves the pace up a notch, while the addition of John Britton's brother on trumpet gives the tune a little more urgency. The brothers' frontline playing is stylish and John's funky solo, underpinned by some effective comping from Davis, complements Britton's own more refined playing which makes full use of the tenor's range. "Good Times" is structured around Jordan Berger's edgy, hip-hop-influenced bass line. Davis' guitar solo softens this edge somewhat, with some lovely single note runs, and then makes way for Britton's most creative tenor worka solo that builds its tension gradually before release, demonstrating the saxophonist's command of dynamics, as well as showing a slightly wilder, more emotive side to his playing. 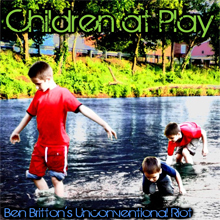 So, three tunes that showcase a band having fun, but also a band with creativity and flair, Children At Play is a welcome introduction to Ben Britton's Unconventional Riot: a brief taste of things to come, and a clear sign that such things will be worth anticipating. Track Listing: Children At Play; Partly; Good Times. Personnel: Ben Britton: tenor saxophone; Matt Davis: guitar; Jordan Berger: bass; Gabe Globus-Hoenich: drums; John Britton: trumpet (2).